6210 2005 Shortwave Gold. Oldies, ID jingle. SINPO 34333. 6220 2017 Radio Tango Italia. Tango music. SINPO 34333. 6240 2010 Radio Hitmix. BZN song. SINPO 34333. 6290 1940 Radio Rode Adelaar. Slow song, ID jingle. SINPO 54444. 6320 2014 Radio Black Bandit. Talking in Dutch, country music. SINPO 54444. 6320 2030 Radio Zodiac. ID, country rock. SINPO 44333. 6940 1955 Premier Radio. Jacksons "I Want You Back," ute QRM. SINPO 33333. 6950 1958 Radio Blackbeard. Greetings with echo-effect, dance music. SINPO 54444. 6965 1950 Radio GSV. Oldies. SINPO 24332. 6980U 2020 Radio Kipspies. Move from 6990. Good peaks. SINPO 34433. 6990U 1945 Radio Kipspies. Oldies. SINPO 34333. 6290 1747 Radio Skywire. Weak signal, just detect snatches of audio. SINPO 24332. 6305 1732 Radio Telstar. Plastic Bertrand "Ca Plas Pour Moi." SINPO 44433. 6380 1737 Radio Jamaica. Oldies. SINPO 34333. 6747 1725 Radio Pioneer. Smokie "Lay Back in the Arms of Someone." SINPO 34333. 6900L 1757 Baltic Sea Radio. Oldies. SINPO 24332. 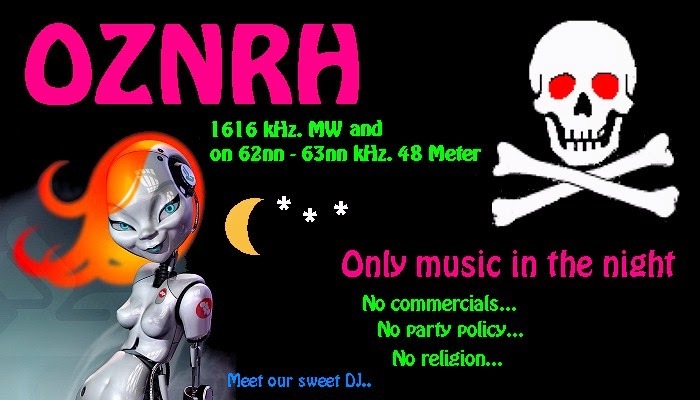 A new QSL has arrived from Ireland's only remaining shortwave free radio station. Premier Radio is a regular on 43 metres and a quick QSLer. Many thanks. 6290 2053 Radio Mustang. Greetings, testing modulation, dance music. SINPO 55444. 6920 2057 Premier Radio. Move from 6960. Country song, good signal. SINPO 44333. 6930 2033 Little Feat Radio. ID, greetings, oldies, quite crackly tonight. SINPO 44333. 6950 2015 Laser Hot Hits v Blackbeard. ABC "Night you Murdered Love," Forever Young." SINPO 44333. 6960 2043 Premier Radio. Oldies, ID jingle. Some utility splash, SINPO 33333. 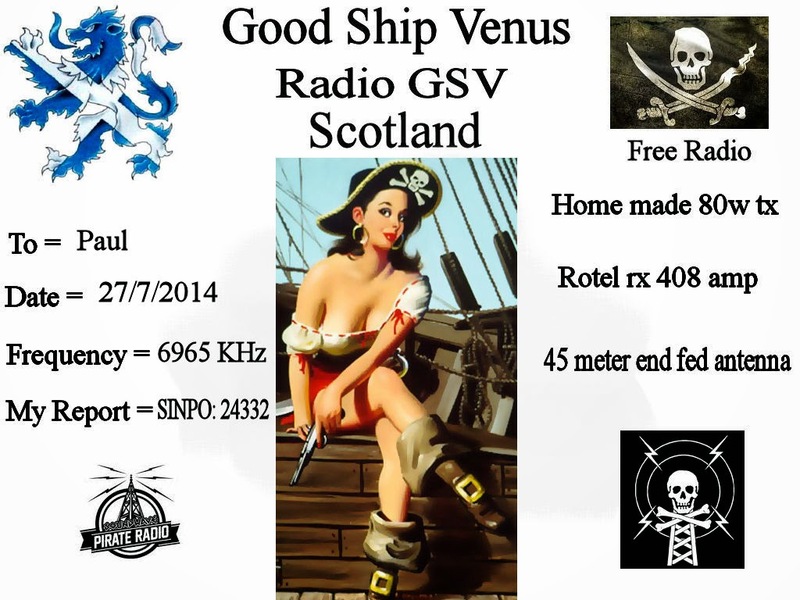 A very attractive QSL landed in my inbox from Radio GSV, a new shortwave pirate from Scotland. Many thanks. 6205 0801 Radio King SW (pres). Relay Radio Caroline. SINPO 24332. 6210 1810 Shortwave Gold. 70s disco. SINPO 34333. 6240 0812 Free Radio Bumbelstock. Oldies. SINPO 24332. 6240 1940 Radio Borderhunter. 10cc "Wall Street Shuffle." SINPO 54444. 6286 0755 Radio Focus Int. Pat Benatar "Heartbreaker," contact details. SINPO 34333. 6305 1815 Radio Quintus. Shocking Blue "Never Marry a Railroad," ID, greetings. SINPO 44433. 6305 1933 Radio Mustang. Dolly Parton "Nine to Five," finally IDed at 1957. SINPO 54444. 6950 1930 Radio Coax. ID, polka. SINPO 24332. 3905 2023 Radio Alice. Instrumental tune, Dutch song. SINPO 54444. 6200 2107 Radio Technical Man. ID, electro music. SINPO 54444. 6210 2150 Shortwave Gold. 70s music. SINPO 33333. 6220 2012 Tip & Elvis Show. ID, greeting listeners, dance music, very strong. SINPO 55444. 6237 2018 Radio Black Bandit (tent). Polka, country music, no ID but style of music similar to BB. SINPO 54444. 6240 1713 Radio Ronalisa. Music just audible, quite noisy. SINPO 24332. 6265 1958 Radio Nora. Rock, ID, 60s music. SINPO 54444. 6265 2054 Radio Montferland. QSO with Nora, country music. SINPO 54444. 6286 1655 Radio Focus Int. Billy Joel "My Life." SINPO 44433. 6295 2050 Radio Scotland Int. ID, greeting listeners, Fat Boy Slim "Right Here Right Now." SINPO 55444. 6305 2038 Radio Powerliner. The LAs "There She Goes," The Smiths "This Charming Man," ID, SINPO 44433. 6311 2005 Radio Pandora. Chat & oldies. SINPO 24332. 6727 1705 Tower Radio. Greetings, oldies, also on 1611. SINPO 44333. 6905L 2138 Baltic Sea Radio. ID jingle, pop. SINPO 34333. 6965 2100 Radio GSV. Oldies, weak signal. SINPO 24332. 6978 1948 Rock Radio Network. Relay of English FM station Reading Rock. SINPO 44333. 6200 1752 Radio Technical Man. Dance music, ID, "I've Been Thinking About You." splash from 6195. SINPO 53443. 6220 1758 Radio Tango Italia. Tango music. SINPO 34333. 6260 2055 RNW (tent). Steve Miller Band. SINPO 44333. 6280 2033 Radio Odynn. Reggae music "The Harder they Fall," SINPO 54444. 6286 1740 Radio Focus Int. "Carrie Bany," "So Much Love," ID and contact details. SINPO 44444. 6300 2039 Radio Akai. Polka, ID in Dutch. Good signal. SINPO 44433. 6380 2025 Unid. "Dragon's Legend," "Just An Illusion," then off, couldn't catch the ID. SINPO 24332. 6450 1735 Studio 52. Dutch songs. SINPO 34333. 6945 2050 Little Feat Radio. ID, greetings, Tina Turner. SINPO 44333. 12030L 1905 Over 60 Degree Radio. Blues music. SINPO 34333. 6200 2040 Radio Technical Man. Dutch songs. SINPO 54444. 6290 2028 Radio Rode Adelaar. ID, Dutch instr music. SINPO 54444. 6300 2032 Radio Pluto. ID jingle, Mike Oldfield song. SINPO 44333. 13680 2035 Sluwe Vos Radio. ID, music. SINPO 24332. Reported in Iann's chat being heard 55555 in Moscow! 13860 2055 Radio Black Arrow. Music just audible. Surprised to hear anything considering the short distance. SINPO 24332. 6240 2041 Voice of the Netherlands. Move from 6300. "Whisky in the Jar." SINPO 54444. 6284L 1813 Over 60 Degree Radio. Relay of Artem's World Music show with African music. SINPO 24332. 6290 1819 Hitmix Radio. ID, said closing down, slow German song. SINPO 54444. 6291 2038 Radio Caroline Int. ID jingle, rap music. SINPO 44333. 6300 2005 Voice of the Netherlands. Rock music, ID 2033. SINPO 54444. 6380 1800 Radio Jamaica. Dutch music. SINPO 34333. 6666 2015 Radio Carmen. Cream "The White Room," dance music, ID jingle. SINPO 54444. 6735U 2028 Cool AM. Led Zep. SINPO 24332. 6950 2023 Little Feat Radio. ID, greetings, "It's My Party." SINPO 34333. Nice QSL received from Cool AM. 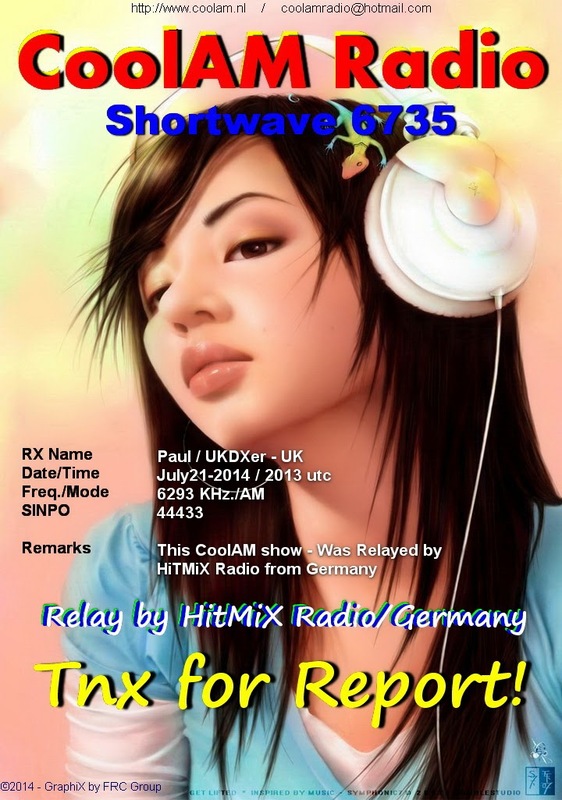 Good signal on Monday, relayed by Hit Mix Radio. Many thanks. 6210 2020 Shortwave Gold. Boney M "Ma Baker." SINPO 34333. 6265 2035 Hitmix Radio. Move from 6293 to avoid QRM. ID, German song. SINPO 54444. 6293 2000 Cool AM via Hitmix Radio. Trio "Da Da Da", ID jingles, strong peaks. SINPO 44433. 6305U 2007 Radio Python. ELO "Mr Blue Sky," off then back for QSO with weaker station. SINPO 44433. 6799L 2056 Radio Mistero Ghost Planet. ID, greetings, multli-lingual ID jingle. SINPO 34433. Pirate Radio: An Illustrated History by Keith Skues and David Kindred available for pre order from Amazon for £15.15, publication date 28 September 2014. Keith Skues is a British radio personality who has been on the airwaves for more than 50 years. He was a pirate radio DJ for Radio Caroline, Radio Luxembourg and Radio London. Keith was one of the original presenters for BBC Radio One and can still be heard on BBC Three Counties Radio today. David Kindred has worked in professional photography for over fifty years. He was a staff photographer with the East Anglian Daily Times and Evening Star when he took these unique and beautiful photos of the pirate radio stations and their crew. 6285 1905 Bogusman. Elvis Costello "Veronica", chat about buying records, strong peaks. SINPO 44433. 6305 1845 Radio Bermadadreieck. Oldies, according to Dr Tim, it is a show from 2007. SINPO 24332. 6205 1757 Radio Tango Italia. Tango music. SINPO 34333. 6210 1801 Shortwave Gold. ID jingle, oldies. SINPO 34333. 6250 1129 Radio Groenteboertje. "Standing in the Lonely Light of the Silver Moon." Very strong. SINPO 55545. 6290 1752 Radio Black Bandit. Dutch talk, Dutch song. SINPO 54444. 6300 1135 Radio Five. "Una Paloma Blanca," contact via swch@live.nl according to Dr Tim, possibly relay by SWCH. SINPO 34333. 6305 1748 Radio Merlin Int. Cars "Just What I Needed," ID, "Lido Shuffle." SINPO 33333. 6545 1806 Radio Discovery. Music just audible, website at radiodiscovery.webs.com SINPO 24332. 3905 2009 Skyline Radio Int. Instr music. SINPO 34333. 6170 1956 Radio Odynn. Crazy World of Arthur Brown "Fire," greetings. SINPO 44333. 6205 1943 Radio Tango Italia. Tango music. SINPO 34333. 6210 1952 Shortwave Gold. Voyage "From East to West," SINPO 34333. 6220L 2017 Radio Minipower. Jazz music. SINPO 44433. 6240 1948 Radio Powerliner. Dutch music. SINPO 24332. 6306 1938 Radio Joey. Talk Talk "Such A Shame." SINPO 44333. 6747 1910 Radio Pioneer. "Only the Lonely," "Save the Last Dance For Me," SINPO 44333. 6803 1915 Radio Pink Panther. Sixties music. SINPO 44333. 6930 2001 Radio Focus Int. The Clash "London Calling," ID, asking for reports. SINPO 44333. 6940 2025 Little Feat Radio. Oldies, ID jingle. SINPO 34333. 6205 2005 Radio Tango Italia. Tango music. SINPO 34333. 6210 2000 Shortwave Gold. Disco. SINPO 34333. 6215L 2025 Radio Minipower. Jazz music. SINPO 34433. 6240 2015 Radio Ronalisa. Music just audible, said only using 2W. SINPO 24332. 6285 1952 Radio Rode Adelaar. BZN, then Boney M "Daddy Cool." SINPO 44433. 6925U 2008 Over 60 Degrees Radio. Edgar Winter special. SINPO 34433. 6210 1936 Shortwave Gold. Usual 70s disco. SINPO 34333. 6285 1943 Radio Black Arrow. Blue Oyster Cult "Don't Fear the Reaper." SINPO 54444. 6747 1925 Radio Pioneer. Dire Straits song. SINPO 54444. 6210 1955 Shortwave Gold. Disco, ID jingles. SINPO 34333. 6220 2000 Radio Columbia. Oldies, utility and SSB QRM. SINPO 22332. 6290 2010 Radio Hitmix. "Red Red Roses," ID. SINPO 44433. 6300 2005 Radio Blauwe Panter. Instr music, occasional IDs. SINPO 44333. 6325 2015 Radio Mazda. "Mississippi," ID, greetings, utility QRM. SINPO 53443. 6735 2055 Cool AM. Weak signal, occasional peaks on music. SINPO 24332. 6930 2047 Premier Radio Int. "I've Got the Music In Me," SINPO 33333, switched to 6915 at 2049 to avoid buzzing QRM. SINPO 34333. 6165 1903 Odynn Radio. "This Old House," antenna test, greetings, ID. SINPO 54444. 6216 1914 Radio Zodiac. ID jingle, Ram Jam "Black Betty," strong peaks. SINPO 44433. 6285 1625 Radio Telstar. Showaddywaddy "Pretty Little Angel Eyes," greetings, ID. SINPO 44433. 6295 1745 Radio Rode Adelaar. "I'm A Yesterday Man," SINPO 44433. 6305 1751 Radio Altrex. ID, oldies. SINPO 24332. 6390.5 1908 Radio Dutchwing. Country music. SINPO 44433. Our main system (SW and MW) works on the best way. We can now transmit with up to 1 kW. P/P on SW (62nn - 63nn kHz / 48 Meter) and 'still' 500 W P/P on MW (1616 kHz.). BUT we still missing to repair our MW antenna and make the new SW antenna. So therefore we still have a break until those thing is done. When we can realize is a bit unclear, because weather and the old man (me) health also is a part of it. But follow here. More news will come soon. 6200 0830 Radio Technical Man. Jackson Browne song, ID. SINPO 44444. 6210 1858 Shortwave Gold. Disco. SINPO 34333. 6220 1849 Radio Columbia. "Black is Black." SINPO 24332. 6238 2205 Radio Underground. Abba "Chiquitita," greeting listeners. SINPO 54444. 6300 0820 Radio Montferland. Eagles "Take it Easy," SINPO 34333. 6300 1435 Radio Norton. Dutch music. SINPO 24332. 6306 1440 Radio Joey. Spandau Ballet "Gold," ID. SINPO 34333. 6320 1445 Trans Europe Radio. Talk Talk "It's My Life," closing down. SINPO 34333. 6325 1902 Radio Waves Int. Oldies. SINPO 24332. 6803 1455 Radio Pink Panther. Oldies. SINPO 34333. 6950 1428 Laser Hot Hits. Martin Scott show. Dance music, talk about World Cup. SINPO 44433. 6968 0837 Radio Focus Int. "Popcorn", ID, contact details. SINPO 34333. 7605L 1934 Over 60 Degree Radio. Blues music. SINPO 34433. 6150 1715 Radio Odynn. Arthur Brown "Fire," greetings, testing new antenna. SINPO 34333. 6200 1922 Radio Technical Man. ID, Manic Street Preachers "If You Tolerate This." SINPO 54444. 6205 0736 Radio King SW. Bananarama. SINPO 24332. 6210 1928 Shortwave Gold. 70s disco. SINPO 34333. 6220 1933 Radio Columbia. Oldies. SINPO 24332. On 6218 at 1953. Signal still weak. SINPO 24332. 6300 1807 Radio Lowland. Cutting Crew "I Just Died in Your Arms." SINPO 34333. 6320 2040 Radio Caroline Int. Jingles and Greek music, splash 6325. SINPO 33333. 6325 2010 Radio Telstar South. The Beatles "She Loves You," ID jingle, recording of World DX News from AWR (from the 1970s). SINPO 44333. 6450 1938 Radio Ronalisa. Weak signal, some utility QRM. SINPO 23332. 6666 1748 Radio Carmen. Dance music. SINPO 54444. 6747 1555 Radio Pioneer. Dutch song, then country song "Put Another Log on the Fire." SINPO 34333. 6922L 2050 Baltic Sea Radio. ID jingle, music (Finnish?). SINPO 34433. 6968 0725 Radio Focus Int. Sparks "This Town Aint Big Enough," Roxy Music "Let's Stick Together," ID, asking for reports. SINPO 34333. 6978 2105 Rock Radio Network (pres). Prog rock. SINPO 44433. 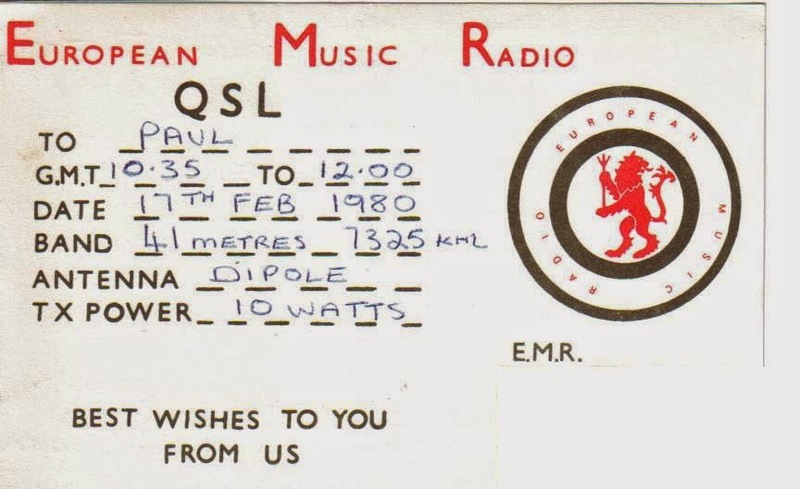 QSL received from Dutch pirate Radio Jamaica. Many thanks! 6205 2030 Radio Tango Italia. Tango music. SINPO 34232. 6210 2010 Shortwave Gold. "I Haven't Stopped Dancing Yet," ID jingle. Lot of static tonight. SINPO 34232. 6210 1932 Shortwave Gold. "Is It Love You're After", ID jingles. SINPO 34333. 6285 1900 Radio Black Arrow. "Land of the Living," off then back with dance music. SINPO 54444. 6305 1904 Radio Python. Greetings, "Another Brick in the Wall." SINPO 54444. 6320 1919 Radio Caroline Int. Dance music, ID jingles. SINPO 44433. 6210 1927 Shortwave Gold. Usual disco music and jingles. SINPO 34333. 6290 1913 NMD Radio. Country music, ID jingle, polka. SINPO 44333. 6305 1922 Radio Merlin Int. Oldies. SINPO 24332. 6210 2050 Shortwave Gold. 70s disco, ID jingles. SINPO 33333. 6261 2045 Radio Experience. Dance music. SINPO 44333. 6305 2040 Radio Merlin Int. Jethro Tull, ID. SINPO 34333. 6747 2035 Radio Pioneer. Animals "House of the Rising Sun." SINPO 54444. 6930 2111 Premier Radio Int. Move from 6950. "I Hear You Knocking." SINPO 54444. 6940 2100 Little Feat Radio. Dolly Parton "Jolene," ID, greetings. SINPO 44333. Move to 6930 after Premier closed at 2120. SINPO 44333. 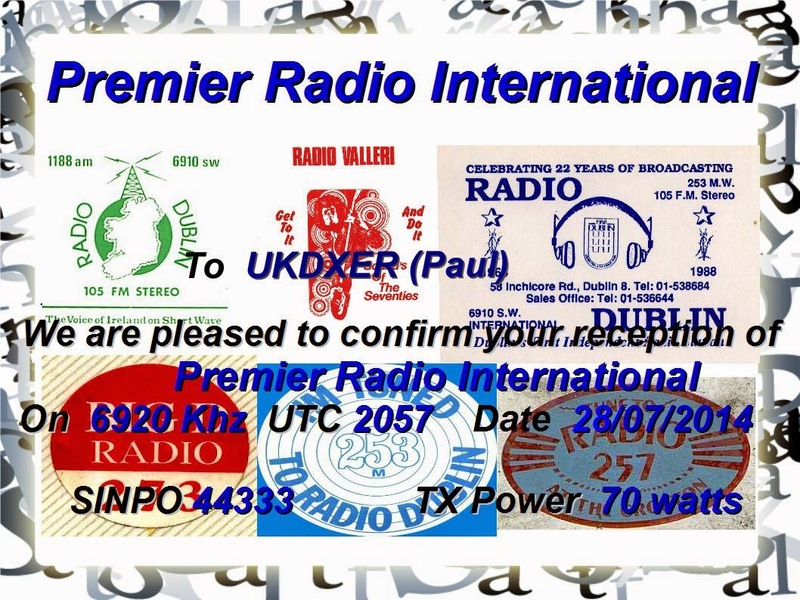 6950 2025 Premier Radio Int. "Upsidedown," "Love Machine," SINPO 43333. 6978 2030 Rock Radio Network. Rock music. SINPO 54444. 6205 0838 Radio King Shortwave. Oldies and jingles. SINPO 34333. 6210 1943 Shortwave Gold. Rose Royce "Car Wash," SSB QRM . SINPO 33333. 6220 1823 Skyline Radio Germany. Weak signal. SINPO 24332. 6240 1948 Radio Caroline Int. Caroline jingles, dance music. SINPO 43333. 6245 1727 Radio AC DC. Simple Minds "Alive & Kicking," "Rawhide", ID, greetings. SINPO 44433. 6260 1515 Station HMG. "Don't Be Cruel," "Teddy Bear," closing down soon, off with no announcement. SINPO 34333. 6285 0825 Top Radio. "What A Wonderful World," "Big in Japan." SINPO 34333. 6285 1520 Summer Meeting Radio. Artem on the mic, Dutch music from the Summer Meeting. SINPO 54444. 6301 1953 Summer Meeting Radio. Moved from 6285, utility QRM. SINPO 43433. 6305 1840 Radio Dr Tim. Broadcasting from the Summer Meeting. Schlager. SINPO 34333. 6320 1747 Radio Pluto. Siouxsie & The Banshees, ID, greetings. SINPO 44433. 6320 1835 Radio Akenzo. Dance music. SINPO 44433. 6380 1525 Radio Jamaica. Music just about audible. SINPO 24332. 6390 1756 Radio De Kat. "Doctoring the Tardis" KLF, "The Rave" Yello." SINPO 44433. 6425 1907 Studio 52. Dutch music, greetings. SINPO 34333. 6747 0808 Radio Pioneer. "You've Got the Look," SINPO 44433. 6960 0817 Radio Focus Int. Sixties music. SINPO 44433. 9510 0845 Radio City v IRRS. "365 A Year," SINPO 55544. 9905U 1530 Baltic Sea Radio. "Johnny B Good," seagulls ID, some utility QRM. SINPO 33333. 4015 2035 Laser Hot Hits. ELO, then Pink Floyd. SINPO 34333. 6205 1955 Radio Tango Italia. Tango music. SINPO 34333. 6210 1958 Shortwave Gold. ABC "Poison Arrow," ID jingle. SINPO 34333. 6266 2018 Radio Digital. Jean Michel Jarre music. SINPO 44333. 6280 1950 Radio Merlin Int. Difficult to hear through utility. SINPO 32332. 6290 1945 Radio Rode Adelaar. Survivor "Eye of the Tiger." SINPO 54444. 6300 1940 Radio Lowland. Rock, with special guests Alf & Per, utility splash. SINPO 43433. 6322 2042 Summer Meeting Radio. Live from the Dutch pirate get-together. "Ca Plas Pour Moi," "Let's Dance." SINPO 54444. 6735u 1935 Cool AM. Sparks "This Town Ain't Big Enough." SINPO 34333. 6803 2002 Radio Pink Panther. "Knocking on Heavens Door," utility splash. SINPO 53443. 6915 2007 Premier Radio. "Macarena," "It's My Life." SINPO 34333. 6960 2030 Unid. Offshore radio documentary, strong peaks. Irish Paul logged Focus. SINPO 44433. 6220 1658 Radio Zeewolf. Polka, ID, greetings. SINPO 44433. 6265 1635 Radio Digital. "Hang on Sloopy," "Sha La La Lee," ID at 1655, occasional utility QRM. SINPO 43433. 6305 1708 Radio Merlin Int. ID, Pretenders song. SINPO 34333. 4015 1920 Laser Hot Hits. Dave Simpson show.Sixties music. SINPO 24332. 6262 2032 Radio Tidalwave. Flock of Seagulls " I Ran," ID, greetings, email. SINPO 54444. 6305 2010 Radio Python. ID, greetings, alternative music. SINPO 34333. 6320 1900 Radio Caroline Int. "You Win Again," dance music, ID jingles. SINPO 34333. 6380 1910 Radio Jamaica. ID, talk in Dutch, Dutch song, then "Substitute" Clout. SINPO 34333. 6401 2015 Radio Mazda. Polka, ID, greeting listeners, "Apache." SINPO 54444. 4015 2015 Laser Hot Hits. Oldies, poor signal tonight. SINPO 24332. 6170 1912 Radio Flying Dutchman. Move from 6210. ID, greetings, "I Feel Love," clear 49mb frequency. SINPO 44433. 6210 1910 Radio Flying Dutchman. Co-channel SW Gold. Status Quo "Again Again." SINPO 33333. 6210 1940 Shortwave Gold. 70s disco. SINPO 34333. 6290 1905 Radio Rode Adelaar. Instrumental music, ID jingle. SINPO 54444. 6305 1928 Radio Merlin Int. "Man of Action," Caroline recordings. SINPO 34333. 6735 2039 Cool AM. Oldies. SINPO 24332.